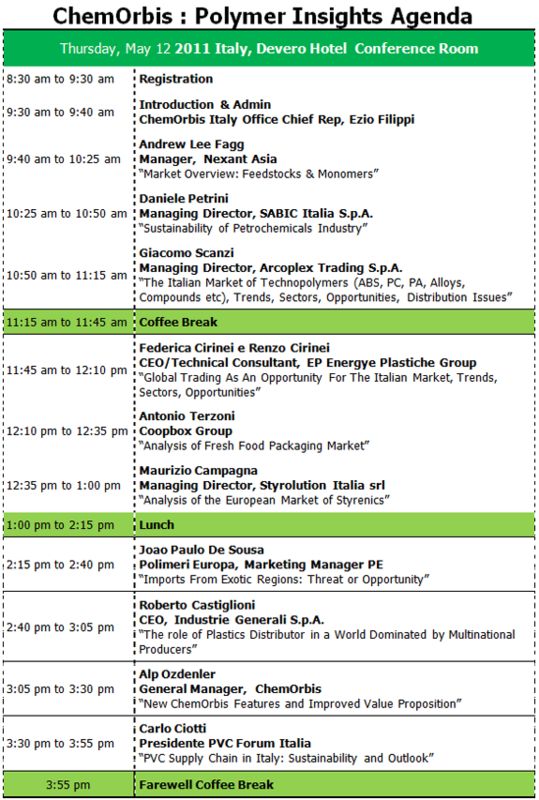 More than 150 participants attendeed the "ChemOrbis: Polymer Insight" meeting which was held in Milano on May 12, 2011. "ChemOrbis: Polymer Insights" event is open to all market players in the plastic world--converters, distributors, traders and producers of polymers in addition to other companies active in the sector like machinery producers, ancillary service providers, additive producers, compounders, etc. who are interested in a review of the latest market trends. GI PLASTIC GROUP VENDING S.R.L. BASF TURK KIMYA SAN VE TIC LTD. STI. KANSAI ALTAN BOYA SAN.VE TİC.A.Ş. PAKOPLAST PLASTIK SANAYI VE TICARET A.S.
PLASMAR PLASTİK VE KİMYA SAN.TİC.A.Ş. 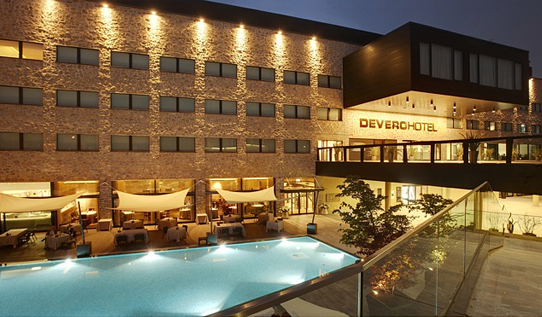 A world apart from hotel clichés, Devero Hotel Four-Star Executive attends impeccably to the needs of the modern traveller, defining new standards in hospitality and attention to detail. This oasis of style and comfort is sure to make your trip, whether for business or pleasure, an experience beyond comparison. 138 rooms, 6 duplex lofts, 2 Executive Suites, 1 Penthouse suite, panoramic glasshouses for receptions accommodating up to 400 covers, interior and exterior Bar and Lounge Bar, Conference Centre with fully equipped modular meeting rooms for between 20 and 500 delegates, 2 Restaurants, indoor Car Park with 150 spaces and secure garages, Gymnasium equipped by Technogym, Wi-Fi Internet Connection throughout the hotel, 3 Internet Points with printer in lobby.